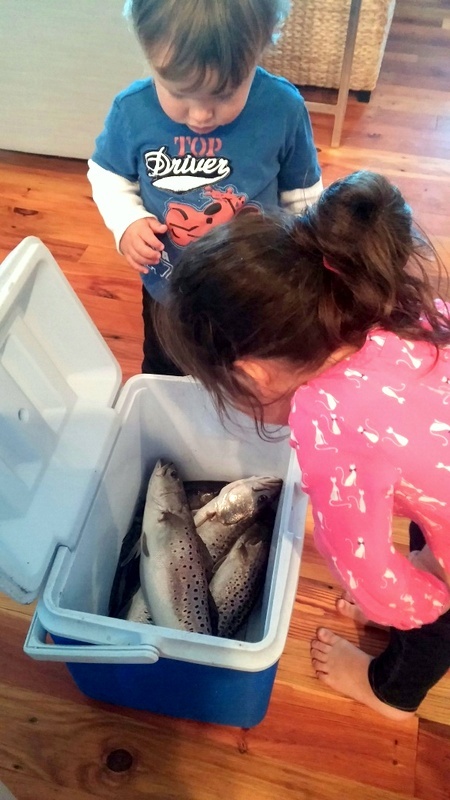 With these guys bringing home a cooler of trout every few days, we’ve had to pull out the recipe books to keep dinner interesting. Fresh fried trout is hard to beat for sure. Our go-to recipe is easy, just dredge in seafood breader, then dip in egg wash with hot sauce, then back in the breader, fried it up in peanut oil…..lemon and remoulade, delish. But our neighbor gave us a recipe, now tried and true on friends and family, that rivals the fried trout if not trumps it! If you’re a fish fan, you have to try this trout cake recipe: Combine 2tbsp olive oil, 4 trout fillets, 1/2 diced bell pepper, 1/2 diced onion, 1 cup fresh spinach, 1tbsp Worchestershire sauce, 1tsp garlic powder, 1tsp dry mustard and 1tsp pepper in a skillet. Cook and stir, flaking fish apart as you go. Put the mixture into a bowl and add 1/2tsp salt, 1tbsp dill, 2 eggs and 1/2 cup panko and mix everything together. Put about 1 cup panko on a plate, get a handful of the mixture, dredge both sides in panko and drop into a heated pan with a few tbsps olive oil. Brown on both sides, around 4 minutes a side, and serve with fresh lemon. We’ve even made sliders out of them….a definite crowd pleaser!